IEEE Canada W.S. Read Outstanding Service Medal: For volunteering within IEEE at the local level and within several societies. Fabrice Labeau (SMIEEE) is Associate Dean (Faculty Affairs) at McGill University's Faculty of Engineering, where he also holds the NSERC/Hydro-Québec Industrial Research Chair in Interactive Information Infrastructure for the Power Grid. He joined McGill's ECE Department in 2000 after receiving a PhD degree from Université catholique de Louvain in Belgium. Dr. Labeau's conference organizing skills and delivery of IEEE Technical Activities Board programming have impacted across all of IEEE Canada. 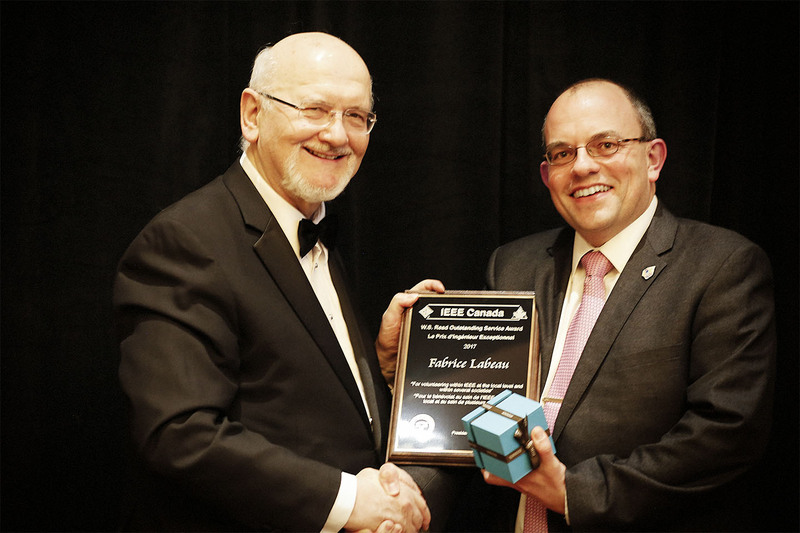 A major focus of his efforts has been within the IEEE Vehicular Technology Society (VTS). His leadership in a series of Montreal and Quebec City VTC Conferences began in 2006 as TPC Chair, progressing to serve as General Co-Chair for Fall VTC 2016. As Chapters coordinator, he helped increase chapter count by 10%; he also oversaw the revival of and is still managing one of the largest IEEE Distinguished Lecturer programs. He was President of VTS in 2014-2015 and is currently VTS Vice- President (Membership). For these and other efforts he received the 2016 VTS Outstanding Service Award. Within IEEE Montreal Section, he was Chair for 2015-2016, creating five new chapters, reviving two that were dormant as well as an affinity group, and creating an active Industry Relations Committee. He is a member of the Steering Committees for two IEEE transactions and a member of the IEEE Periodicals Committee. Dr. Labeau is heavily involved in McGill's Faculty of Engineering equity, inclusivity and diversity programs; these efforts have been recognized in 2015 and 2017 through the McGill Equity and Community Building Award (team category). IEEE Canada E.F. Glass Western Canada Merit Medal: For volunteering within IEEE at the local level of the Northern Canada Section. Rossitza Marinova (SMIEEE) has been a Professor in Mathematics and Computing Science at Concordia University of Edmonton since 2004. She has a Ph.D. in Computational and Applied Mathematics (Bulgarian Academy of Sciences), M.Sc. in Mathematical Modeling, and B.Sc. in Mathematics (Sofia University, Bulgaria). Dr. Marinova also worked as a research scientist in the software development industry in Canada and in the National Aerospace Laboratory of Japan. She has maintained strong professional scholarship in the areas of computational mathematics, computer science and information technology, and mathematics outreach. 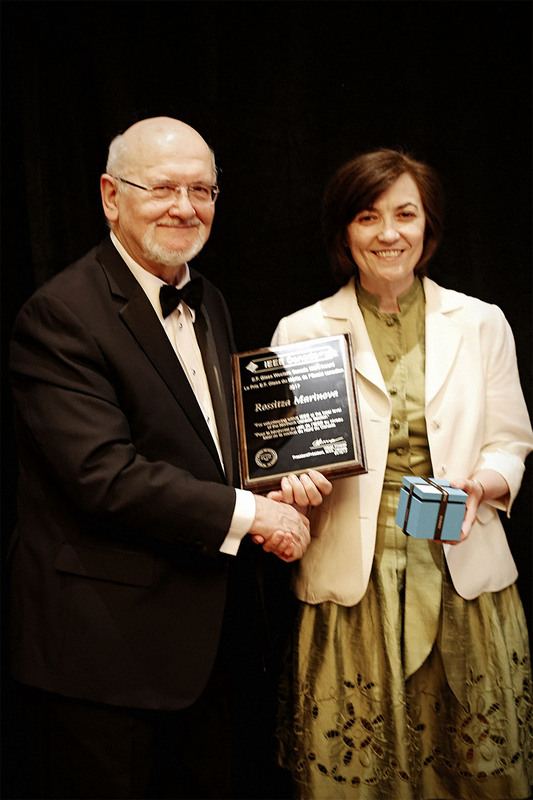 Dr. Marinova's involvement with IEEE started in 2005. Her positions within the Northern Canada Section include vice-chair, chair of various committees such as: Educational Activities, Awards and Recognition, Communications, and the IEEE Teacher In-Service Program (TISP). Nationally, she is a member of the IEEE TISP Canada committee, contributing through her long-standing service as co-secretary, co-organizing numerous Edmonton-area events and playing a role in several national TISP Canada workshops. Moreover, Dr. Marinova contributed to the establishment of the IEEE Concordia Student Branch, being the first branch counsellor. Currently, Dr. Marinova is the Chair of the Canadian Math Kangaroo Contest and Canada's representative in the International Association organizing the competition "Mathematical Kangaroo," for students from grade 1 to 12. Her service includes bringing together supporters to work towards advancement of education by increasing the appreciation of mathematics. Dr. Marinova is a Life Member of Canadian Mathematical Society and a member of Canadian Applied and Industrial Mathematics Society. She has received numerous awards and grants for research and outreach. Ana Luisa, Vice Chair of the IEEE WIE Affinity Group London Section, receives the 2017 Inspiring WIE Member of the Year Honorable Mention. Congratulations on this world-wide recognition! The IEEE Women in Engineering Inspiring Member of the Year is to recognize a professional member of IEEE Women in Engineering (WIE) who has made an outstanding contribution to WIE, their community, and the engineering community, through their dedication and involvement in projects or activities directed toward fulfilling one or more of the WIE goals and objectives. Alise Wanga, Chair of the IEEE WIE Affinity Group University of Ottawa Student Branch, receives the 2017 Inspiring Student WIE Member of the Year Honorable Mention. Congratulations on this world-wide recognition! The IEEE Women in Engineering Inspiring Student Member of the Year Award is to recognize an undergraduate/graduate student member of IEEE Women in Engineering (WIE) who has overcome barriers to pursue engineering and/or who has made a personal impact in their community through their dedication and involvement in projects or activities directed toward fulfilling one or more of the WIE goals and objectives.